My office sits about a block from the Nuclear Energy Institute's (NEI) headquarters in downtown Washington, and I could almost hear the corks popping when the government green-lighted the first new nuclear reactors in decades. The two reactors, which the Southern Company will build next to two currently operating reactors at its Alvin W. Vogtle nuclear plant in Georgia, will be the first licensed by the Nuclear Regulatory Commission (NRC) since 1978. The partial meltdown at Three Mile Island in 1979, along with cost overruns and scores of abandoned projects, scotched plans for new reactors until just last week. "This is a historic day," said Marvin Fertel, president and CEO of NEI, the industry trade association. The NRC vote "sounds a clarion call to the world that the United States recognizes the importance of expanding nuclear energy as a key component of a low-carbon energy future that is central to job creation, diversity of electricity supply and energy security." Christine Todd Whitman, the former Environmental Protection Agency administrator, and Patrick Moore, a former Greenpeace activist, chimed in the next day on the Huffington Post. Co-chairs of the NEI-funded Clean and Safe Energy Coalition, Whitman and Moore wrote that the new reactors "signal [a] U.S. nuclear energy resurgence." To be sure, Fertel and his high-profile spokespeople have something to celebrate. Not only will the two reactors be the first built in decades, they will feature a new advanced design by Westinghouse, which was just approved by the NRC in December. That said, many of their assertions -- about nuclear power's revival, its affordability, its impact on ratepayer bills, its potential to "jumpstart" the economy, and its relative safety -- don't hold up to scrutiny. "Faint" Prospects for Rebirth. The U.S. nuclear industry has spent hundreds of millions over the last decade to promote its revival, and only a few years ago some proponents were calling for as many as 100 new reactors. Now the industry will be lucky if it can get four or five built in the next 10 years. Standard and Poor's credit rating agency said on Wednesday that the likelihood of a nuclear power "rebirth is faint at this time" due to a sluggish economy, depressed electricity demand, and low natural gas prices. The Heritage Foundation was equally lukewarm. Jack Spencer, a nuclear expert with the conservative group, told the Associated Press that the approval of the Vogtle reactors was "good news," but added: "I don't think this is the beginning of a full-scale renaissance." He said "too many questions remain" about nuclear waste, government regulation and new reactor designs. The Economics of New Reactors. Standard and Poor's could have included another major reason the nuclear renaissance has stalled: rapidly escalating construction costs. Indeed, the price tag for a new reactor has more than tripled over the last 10 years. In 2002, the industry estimated it would cost $2 billion to $3 billion to build a typical 1,100-megawatt reactor, which can power about a million homes. Since then, the projected cost has jumped as high as $10 billion, and Wall Street has been unwilling to finance new reactors without massive federal loan guarantees. Those guarantees mean taxpayers are liable if a plant owner defaults, which is not out of the realm of possibility. The Congressional Budget Office estimated that the average risk of default on a federal loan guarantee for nuclear plant construction is 50 percent, and a nuclear project failure would make the Solyndra debacle look like chump change. Georgia Power also will benefit from a federal production tax credit worth hundreds of millions of dollars, according to "Big Risks, Better Alternatives," an October 2011 report by Synapse Energy Economics that reviewed proposed nuclear projects in Georgia and Florida. The tax credit would be worth as much as $250 million annually for the first eight years of operation. In addition, the company is passing along its costs of financing construction, estimated at $1.6 billion, to its customers via a surcharge on their bills, thanks to a law the state legislature passed in 2009 that requires ratepayers to pay for a plant long before it operates--and even if it never does. The average residential customer is now paying about $44 a year to finance the new reactors, and that surcharge will jump to at least $120 a year by 2018 according to Georgia Power's own estimates. "The problem is these surcharges are based on outdated company cost projections while nuclear cost estimates have only gone up around the world," said Ellen Vancko, nuclear energy and climate change project manager at the Union of Concerned Scientists (UCS). "No one can say just how much Georgia ratepayers will be on the hook for if and when these reactors are completed." Better Alternatives. The Synapse report concluded that if the new reactors do come on line, Georgia Power customers would pay top dollar for electricity. 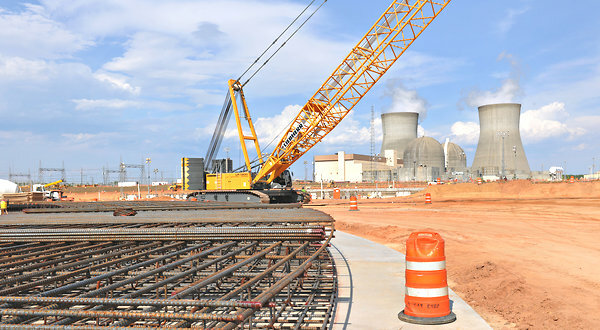 Accounting for construction and operating costs, Synapse compared the cost of the new Vogtle reactors -- which Southern estimates at $14 billion -- with viable alternatives. The mid-range cost estimate for the reactors was higher than improved energy efficiency to cut electricity use, natural gas, biomass, land-based wind, and even coal. The only technologies more expensive than the new Vogtle reactors were offshore wind and solar photovoltaic, which are expected to drop in price over time while the projected cost of new reactors continues to escalate. Overall, Georgia has done an abysmal job promoting energy efficiency, ranking 36th among the states, according to the American Council for an Energy-Efficient Economy's (ACEEE) 2011 scorecard. ACEEE found that Georgia spent $2.18 per person that year on energy efficiency programs, a fraction of the national average of $14.87. The top five states invested $30.28 to $54.62 per person. A 2009 Georgia Tech study concluded that Georgia could cut electricity demand from 11 percent to 27 percent through aggressive energy-efficiency initiatives. The state has done an equally abysmal job developing renewable energy. Twenty-nine states and the District of Columbia have policies requiring utilities to ramp up their reliance on renewable sources. Not Georgia. According to UCS calculations, Georgia's homegrown renewable energy sources have the technical potential to supply at least 84 percent of the electricity ratepayers used in 2008. Marginal Impact on Jobs. In a column Whitman wrote last October for Virginia Business, she called nuclear power a "domestic jobs machine." One new reactor, she said, would produce as many as 2,400 temporary construction jobs, and, once built, employ 400 to 700 full-time workers. In her recent Huffington Post piece, she upped her estimated number of full-time positions to 800. For argument sake, let's entertain Whitman's latest projection and say the four or five new reactors built over the next decade actually create as many as 4,000 permanent jobs. In the grand scheme of things, that's a pittance. The United States needs 100,000 net new jobs every month just to keep the unemployment rate stable. If Whitman were really serious about promoting jobs in the energy sector, she would be talking about energy efficiency and renewable energy, which have the potential to create more jobs than nuclear power, according to studies by ACEEE, Navigant Consulting and UCS. The renewables-efficiency sector is still relatively small, but it's growing. From 1998 through 2007, jobs at renewable energy and energy efficiency businesses nationally jumped 9.1 percent -- more than twice the national average of 3.7 percent--while jobs in the nuclear industry declined 7.9 percent, according to a 2009 Pew Charitable Trusts report. In 2007, 68,203 renewables and efficiency businesses employed 770,385 workers across the country. That same year, the nuclear industry employed 80,242 people. Maybe Safer, but Safe Enough? Finally, Westinghouse claims that its new AP1000 reactor design chosen for the Vogtle site is safer than current generation reactors because it relies primarily on "passive" means, such as gravity and natural heat convection, instead of pumps, valves and other "active" systems. The design also is intended to be less susceptible to a total loss of off- and on-site power, which triggered the meltdowns at the Fukushima Daiichi facility in Japan last March. In their Huffington Post piece, Whitman and Moore allude to these passive systems and claim Westinghouse's design "layers precaution upon precaution" to ensure safety. In fact, the design has a weaker containment, less redundancy in safety systems, and fewer safety features than current reactors, according to Edwin Lyman, a senior scientist with UCS's Global Security Program. It is more difficult to predict the performance of passive systems than active systems, he says, but if passive systems fail to work during an accident, there would be no highly reliable active systems available as a backup. Lyman wants the NRC to thoroughly review the AP1000 and other proposed new designs in light of the Fukushima disaster to ensure they have sufficient safety margins to cope with more severe accidents than they are intended to withstand. For example, the AP1000 is equipped to survive a three-day station blackout under certain conditions, but it is not clear that would be sufficient. The station blackout at Fukushima lasted more than nine days. The NRC, unfortunately, has not conducted the kind of review Lyman says is necessary for designs currently in the licensing pipeline. NRC Chairman Gregory Jaczko apparently was thinking along the same lines last week when the agency voted to grant Southern a license to build and operate the two new reactors. He found himself on the losing end of a 4 to 1 decision -- which has occurred all too often before -- because he wanted assurance from Southern that it would institute safety upgrades based on the NRC's final assessment of lessons learned from Fukushima. "I cannot support issuing this license as if Fukushima had never happened," Jaczko said. "We've given them a license. They have not given us any commitment they will make these changes in the future." Elliott Negin is the director of news and commentary at the Union of Concerned Scientists. UCS, which is neither for nor against nuclear power, has been a nuclear safety watchdog for more than 40 years.